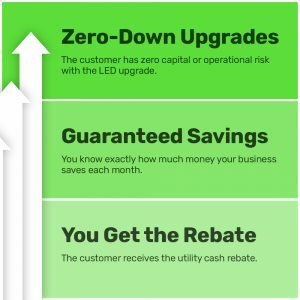 Zero-Down Video – Znergy, Inc.
We fund, design, install and manage a complete LED lighting upgrade, which generates utility rebates and savings that we pass onto you. The upgrade is funded out of a portion of the monthly energy savings but you are cash flow positive from month one. And you keep 100% of the maintenance savings. If a new lamp or fixture ever fails, the service call is 100% covered with no out of pocket for the full term of the program. Znergy’s capabilities include both supplying new LED lighting products or providing a complete turnkey conversion of your business’s existing lighting system to LED. Regardless of whether you choose the Shared Savings program or a straight cash purchase, Znergy provides options to fit your business needs.